Is your car in need of new tyres? Has the tread been worn out? Perhaps you ae thinking of fitting some winter tyres? Here at Car Care we can supply and fit a vast range of tyres from all the leading manufacturers, fitting the perfect tyre for your vehicle’s needs. 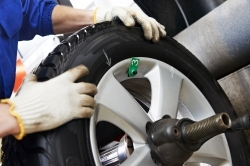 Our tyre fitters can supply and fit standard road tyres as well as high performance tyres. We can also offer practical assistance and advice to help you choose the correct type of tyre. While we fit your new tyres we will also check that your wheels are balanced and aligned properly, ensuring the smooth running of your car. Wheel alignment is essential and can help reduce the wear on your tyres, helping your car run smoothly and safely. When you require affordable tyres, wheel balancing and wheel alignment in Colwyn Bay, call the experts at Car Care today. We can be reached by calling on 01492 530 261.